Under the motto “We automate. 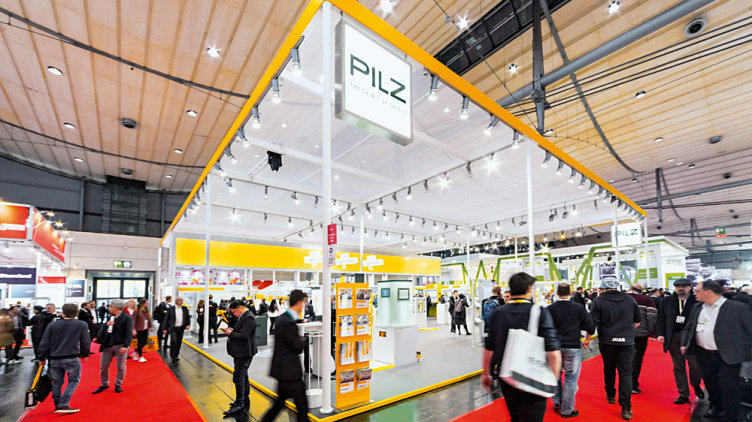 Safely”, for Pilz the main feature of this year’s Hannover Messe is innovative automation solutions that will make the vision of the factory of the future a reality. Come to Hanover and see for yourself what modern automation technology can do! You will find Pilz at the leading trade show “Integrated Automation, Motion & Drives” in Hall 9, Stand D17. Why not take this opportunity to find out about the industry's new products, innovations and trends! Discover on our stand the modular safety gate system that you can use to combine your individual solution for safety gate guarding. With the new light, master and slave versions of the safety laser scanner PSENscan you can implement the most varied applications in the range of stationary and mobile zone monitoring. High machine availability can be ensured with the particularly robust safety light curtain PSENopt II. In addition, Pilz shows in Hannover how Outdoor applications in particular are secured using radar technology. See for yourself the various models in Hannover, how Pilz puts into practice these applications with safe sensor technology! Our Smart Factory plant is one of the “100 places for Industrie 4.0 in Baden-Württemberg” (German initiative). Thanks to decentralised control intelligence, mobile service robotics, intelligent diagnostics and visualisation and Cloud connection, the Smart Factory at our Stand produces various personalised products in batch size 1. From sensor to drive and to control system and robotics, all the Pilz products are used interconnected. Get inspired at our Stand and obtain new stimuli for your production! We are actively helping to shape Industrie 4.0. Visit us in Hannover also at the Stand of SmartFactoryKL in Hall 8. Pilz helps users to achieve a safe and standard-compliant robot application! 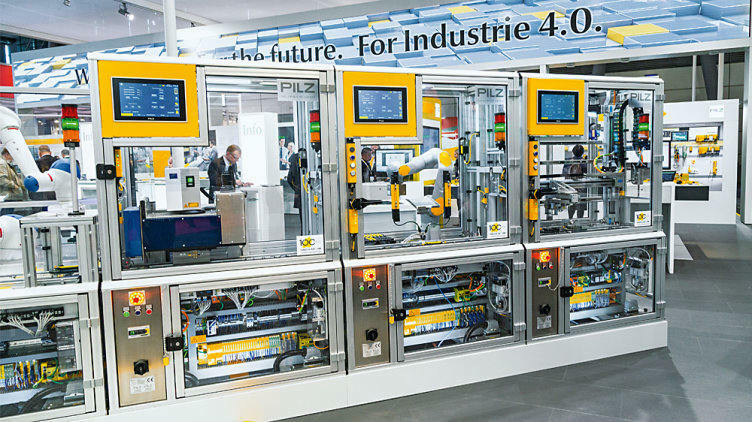 Experience the new Pilz Service Robotics modules on our Smart Factory in action and interact with the root systems! A dual-arm robot packages a workpiece that is taken to the manual workstation and then handed over to you as a visitor. Find out now on our fair stand bout our comprehensive services portfolio in the field of robotics. Our experts are happy to advise you about our offer to safeguard robot cells and for human-robot-collaboration. Innovative new products for your complete automation solution! Remote I/O system PSSuniversal 2 with I/O Link Master: Higher safety by error-free parameter setting of sensors. Service robotics modules: Open for industrial and non-industrial service tasks! CECE – Certified Expert in CE Marking: The highest possible qualification in CE marking. Safety laser scanner PSENscan: Now as light, master and slave version for productive area monitoring! Body protection light curtain and mirror columns PSENopt II: Secure danger zone with robust light curtain on several sides. The modular safety gate system from Pilz: The individual safety gate solution for your application. PSEN code low profile actuator: The lowest actuator in the world for your space-saving application! Safe voltage monitor PNOZ s60: Safely monitors the voltage-free state of your plants and machines. Operating mode selector switch and access authorisation system PITmode fusion: Unites safety and security functions in one system. Safe, small controllers PNOZmulti 2: Analogue input signals and press applications safely monitored with new expansion modules. Motion control systems PMCprimo C2: The control systems for the increased performance of your drives. Servo motors PMCtendo SZ: The synchronous motor now with HIPERFACE DSL! 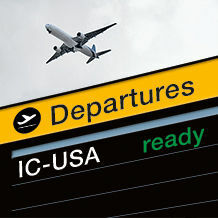 International conformity assessment – USA: Import machines USA-compliant and commission them.